Don't put a limit on your event promotions. 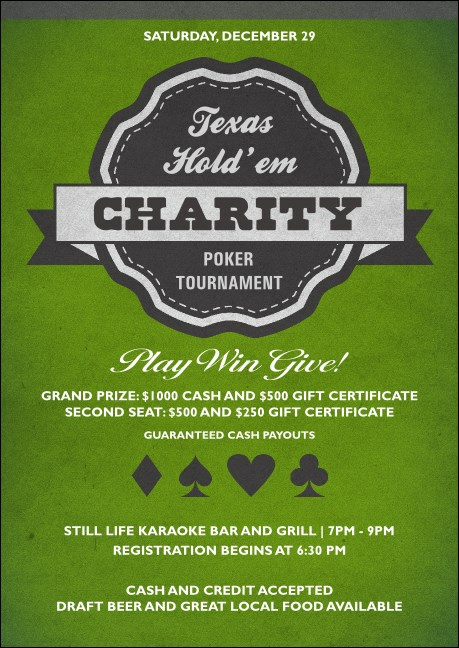 Add the Texas Hold 'Em Postcard and hand to potential guests or leave with supporting businesses. Sharp white text details your tournament information on a lush green card table backdrop. Complete your deck with a Matching Event Kit, with coordinating tickets, invitations, and flyers. Send a stylish reminder with the right postcard from TicketRiver.com.au.